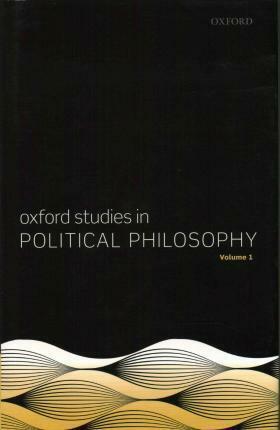 This is the inaugural volume of Oxford Studies in Political Philosophy. Since its revival in the 1970s political philosophy has been a vibrant field in philosophy, one that intersects with jurisprudence, normative economics, political theory in political science departments, and just war theory. OSPP aims to publish some of the best contemporary work in political philosophy and these closely related subfields. This first volume features eleven papers and an introduction. The papers address a range of central topics and represent cutting edge work in the field. They are grouped into four main themes: democracy, political liberalism and public reason, rights and duties, and method. David Sobel is Irwin and Marjorie Guttag Professor of Ethics and Political Philosophy at Syracuse University. Peter Vallentyne is Florence G. Kline Chair in Philosophy at the University of Missouri. Steven Wall is Professor of Philosophy at the University of Arizona.